Barry Crump was one of New Zealand’s most popular authors ever, selling over 1 million copies of his 24 books between the publishing of A Good Keen Man in 1960 through to his death in 1996. Though the reputation he gained in the wake of his turbulent personal life sometimes overshadows his literary career, he remains a superb storyteller, who perfectly captured the lifestyle and laconic humour of the rugged Kiwi outdoors man. His ability to craft a tale that is both moving and funny is superbly illustrated by the huge international success of the movie Hunt for the Wilderpeople, which is based on his book Wild Pork and Watercress. 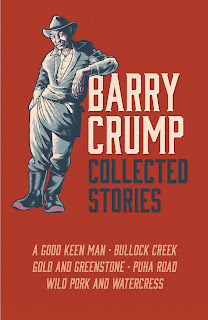 Almost all of Barry Crump’s books are now out of print. This new volume of Collected Stories remedies that, by presenting five of his great classics in a handsome, hardback edition. 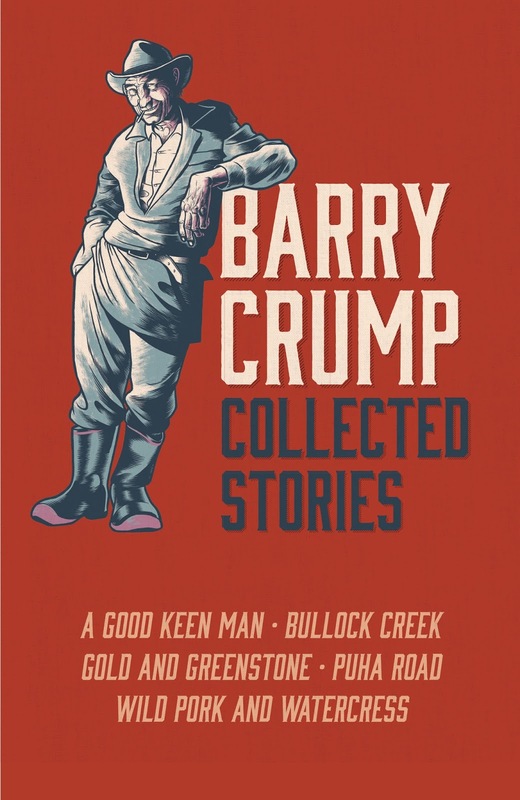 Barry Crump: Collected Stories belongs on the bookshelf of every New Zealand home, an important, highly enjoyable and often hilarious part of our literary heritage. BARRY CRUMP was born in 1935 and died in 1996. In 1959 he began writing humorous sketches of life as a government deer-culler and pig hunter, publishing these as A Good Keen Man in 1960. This became a massive bestseller in New Zealand and over the next 50 years he wrote another 23 books, which sold over a million copies. As well as a best-selling author, Crump was an actor, TV personality, poet, radio commentator, man of leisure, traveller, goldminer, photographer and more. A successful 12-year association with Toyota brought a series of award winning advertisements that catapulted Crump into living rooms around the country with his laconic, blokey style. Crump was married 5 times and had 6 children, all sons. In the 1990s Crump was awarded an MBE and OBE for services to literature, something he was quietly proud of and reckoned they’d be hard case pinned to his Swanndri. He was listed in the Who’s Who as having no fixed abode, and regarded himself as a world citizen. He insisted that, first and foremost, he was just a Kiwi bushman. 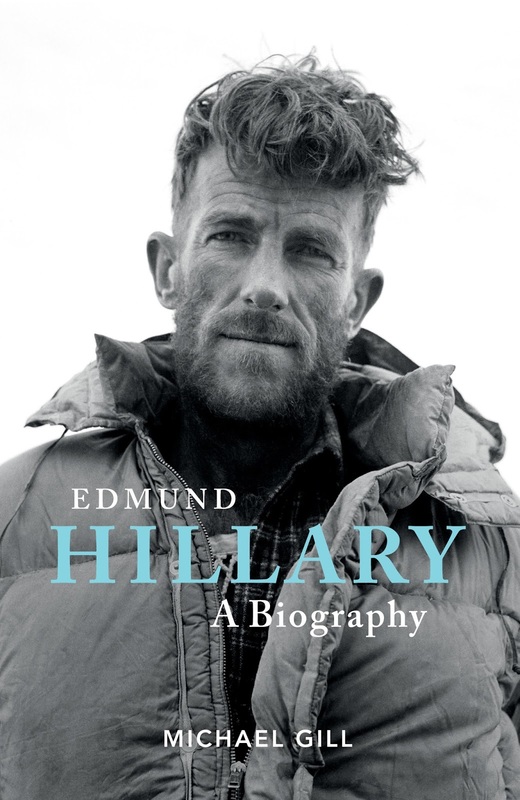 This new and important biography of Sir Edmund Hillary, a truly great New Zealander, breaks new ground among previous accounts of his life. The author, Michael Gill, was a close friend of Edmund Hillary’s for over 50 years, accompanying him on many expeditions, and becoming heavily involved in his Himalayan aid work. He was also granted access by Sir Edmund’s children to a large archive of private papers and photos that were deposited in the Auckland Museum after his death. 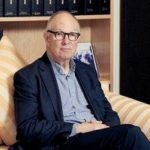 Building on personal experience, and this new unpublished material, Michael Gill has written a wonderfully insightful and illuminating biography. He describes the uncertainties of the first 33 years of Edmund Hillary’s life, as well as the always-fascinating stories of the early attempts on Mt Everest, all a prelude to the first ascent which brought him instant world-wide fame. But too, this biography reveals, in part through personal letters, the tender and loving relationship he had with his wife Louise. Her importance to him during their 22 years of marriage only underlines the horror of her death, along with that of their youngest daughter, in a plane crash in 1975. Sir Edmund eventually pulled out of the subsequent depression to continue his life’s work building schools and hospitals in the Himalayas. Affectionate, but scrupulously fair, Michael Gill has gone further than anyone before to reveal the humanity of this remarkable man. Edmund Hillary’s life was shaped by both triumph and tragedy, and while he became famous through his mountaineering achievements, ultimately it was his humility and great compassion for the people of Nepal that has become his enduring legacy. MICHAEL GILL was a 22-year-old medical student when he followed up on a newspaper statement in 1959 that Sir Edmund Hillary was looking for an additional climber for his next Himalayan expedition. As climber, photographer, doctor and writer, Mike was subsequently invited on nearly all the Hillary expeditions through to the last of them in jet boats up the river Ganges in 1977. He has written two other books, a mountaineering autobiography, Mountain Midsummer in 1989, and Himalayan Hospitals, 2011, an account of the experiences of the doctors and other volunteers who worked for the Himalayan Trust between 1961 and 2002. The debut novel by York bookseller Fiona Mozley has made the cut for the 2017 Man Booker Prize shortlist, along with debuts by George Saunders and Emily Fridlund. Canongate Books has acquired independent Severn House Publishers from owner Edwin Buckhalter and his family for an undisclosed sum. Jamie Oliver’s 5 Ingredients: Quick & Easy Food (Michael Joseph) has rustled up another week in the UK Official Top 50 number one spot, selling 56,966 copies for £675,321 according to Nielsen BookScan’s Total Consumer Market. Icelandic authors Yrsa Sigurðardóttir and Ragnar Jonasson are set to sponsor a new crime writing award to encourage more people to write in their first language. James Hogan, publisher at Oberon Books, has paid tribute to the late Peter Hall, founder of the Royal Shakespeare Company, as a "Titan of the theatre" and treasured author who helped to transform the fortunes of the small independent press 15 years ago. Weidenfeld & Nicolson has appointed Lettice Franklin as commissioning editor. More than 80% of writers are concerned about censorship and ‘fake news’, according to the “alarming” findings of a study by PEN International. Viola Hayden is to join Little, Brown Book Group as commissioning editor at Sphere Fiction. Scribe UK is to publish Chicago Rising, an "ambitious" debut novel by Jonathan Carr. Faber is to publish the tenth novel from David Peace, entitled Patient X, in April 2018. The NBA Poetry Longlist: Contenders for the National Book Award for Poetry include a five-time nominee and three debut collections. A Trump-Russia Connection Book Deal: In March, Twelve will release a book on Russia and Trump, tentatively titled 'The Russian Connection,' by Michael Isikoff and David Corn. Houston's Still a Poet’s City: Before Hurricane Harvey and after, Texas's biggest metropolis is as much a poetry town as a petroleum town. Danny Strong on His Salinger Biopic: Now that he's profiled the 'Catcher in the Rye' author in film form, the 'Buffy: The Vampire Slayer' veteran wants to write a Trump movie. Elana Rabinovitch, Executive Director of the Scotiabank Giller Prize, is pleased to announce that Audible, the world's largest seller and producer of digital audiobooks and other spoken-word entertainment, will be the exclusive audiobook sponsor of the prize. Audible will launch its dedicated Canadian service, Audible.ca, today at Union Station. Actress Elisabeth Moss and author Margaret Atwood will join Audible CEO Don Katz on stage for a live performance of Atwood's The Handmaid's Tale. "We are so glad to be collaborating with Audible," said Rabinovitch. "It's exciting to be at the forefront of a medium that's exploding onto the marketplace." "Audible is committed to supporting talented Canadian writers and voices, and as part of that commitment we are delighted to be the exclusive audiobook sponsor of the Scotiabank Giller Prize," said Audible founder and CEO Don Katz. Audible's initial sponsorship will begin in 2017 and last through the end of the 2018 awards. This year's Scotiabank Giller Prize longlist will be announced at The Rooms in St.John's NL on Monday, September 18 at 11:00 a.m. (NT), 9:30 a.m. (ET). The Scotiabank Giller Prize, founded in 1994, highlights the very best in Canadian fiction year after year. The prize awards $100,000 annually to the author of the best Canadian novel or short story collection published in English, and $10,000 to each of the finalists. The award is named in honour of the late literary journalist Doris Giller by her husband, Toronto businessman Jack Rabinovitch, who passed away in August 2017. Audible, Inc., an Amazon.com, Inc. subsidiary (NASDAQ:AMZN), is the leading provider of premium digital spoken audio content, offering customers a new way to enhance and enrich their lives every day. Audible was created to unleash the emotive music in language and the habituating power and utility of verbal expression. Audible content includes more than 375,000 audio programs from leading audiobook publishers, broadcasters, entertainers, magazine and newspaper publishers, and business information providers. Audible is also the provider of spoken-word audio products for Apple's iTunes Store. The first memoir by Amy Krouse Rosenthal, who died on March 13 at age 51, uses the word “death” only once. I know this because the endpapers include a list: How Many Times Certain Words Appear in This Book. “Cool” appears 22 times, “really” 69, “awkward” and “weird” both six. “Love” gets 78. Mark Warren will join Random House as vice president and executive editor starting October 16. He was previously an editor at Esquire for two decades, and co-authored former Senate Majority Leader Harry Reid's memoir, The Good Fight. Editor-in-chief Andy Ward says: "Mark has the skills and intuition of a great editor, as well as the firsthand experience of an author--perspective and empathy that have earned the respect of the authors with whom he has worked." Brian Geffen has joined Holt Children's as editor. Most recently he was associate editor at Philomel. Cordelia Calvert has been promoted to senior publicist for Liveright. Scholastic Trade has announced a number of promotions and new hires. Lisa Sandell has been promoted to editorial director, Scholastic Press; Michael Petranek is executive editor and Lego publishing manager; April Chorba moves up to senior director of product development for Klutz; Armin Bautista is now designer for Klutz; and Natalia Remis has been promoted to associate editor, Scholastic Press/Orchard/The Blue Sky Press. Additionally, Dan Moser has returned to Scholastic as director of special markets and new business. He was previously at Disney as international brand licensing manager. Heather Daugherty, previously senior designer at Harper Collins, has joined as creative director of licensing and brands. Gina Kim becomes product development manager for Klutz. She previously worked with Crocodile Creek and Alex Toys. Julia Eisler, previously with Grand Communications, has joined as associate manager of marketing and social media. Alexis Kuzma has joined as mass market sales associate. She was previously special markets assistant for Abrams. Orlando Dos Reis, previously assistant editor for Abrams, has joined as editor for Scholastic Press. Philippa Donovan will scout for Circle of Confusion Television Studios, a new joint venture between ITV Studios America and Circle of Confusion (The Walking Dead), "looking to source, develop and produce premium scripted programming." Paul Auster, Emily Fridlund, Mohsin Hamid, Fiona Mozley, George Saunders and Ali Smith are today, Wednesday 13 September, announced as the six shortlisted authors for the 2017 Man Booker Prize for Fiction. Their names were announced by 2017 Chair of judges, Lola, Baroness Young, at a press conference at the offices of Man Group, the prize sponsor. The shortlist, which features three women and three men, covers a wide range of subjects, from the struggle of a family trying to retain its self-sufficiency in rural England to a love story between two refugees seeking to flee an unnamed city in the throes of civil war. Two novels from independent publishers, Faber & Faber and Bloomsbury, are shortlisted, alongside two from Penguin Random House imprint Hamish Hamilton and two from Hachette imprints, Weidenfeld & Nicolson and JM Originals. Ali Smith makes the Man Booker shortlist for the fourth time (she was previously shortlisted for Hotel World in 2001, The Accidental in 2005 and How to Be Both in 2014). This year also sees a repeat shortlisting for Mohsin Hamid, who made the list in 2007 with The Reluctant Fundamentalist. Hachette imprint JM Originals makes the shortlist for the first time with Fiona Mozley’s Elmet, which was the first ever acquisition of assistant editor Becky Walsh. Mozley is also the youngest author on the shortlist, aged 29, and one of two debut writers to make the list – the other being 38 year-old American Emily Fridlund with History of Wolves. The other two American authors on the shortlist are Paul Auster and George Saunders. 4321 by Auster, who turned 70 this year, is the longest novel on the shortlist at 866 pages and, according to the author, took three and a half years, working 6 and a half days a week, to write. Lincoln in the Bardo, the first full-length novel by Saunders — an acclaimed short story writer and Folio Prize winner — completes the list. The judging panel, chaired by Lola, Baroness Young, consists of: the literary critic, Lila Azam Zanganeh; the Man Booker Prize shortlisted novelist, Sarah Hall; the artist, Tom Phillips CBE RA; and the travel writer and novelist, Colin Thubron CBE. 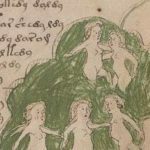 The 2017 winner will be announced on Tuesday 17 October in London’s Guildhall, at a dinner that brings together the shortlisted authors and well-known figures from the literary world. The ceremony will be broadcast by the BBC.